Previously on Back to the Future, I hassled the second film in the franchise quite a bit on being a bit overcrowded with its story and confusing with various character traits that didn’t exactly meet the requirements set forth in the first film. It was all over the place in some regards, still…I love the movie a lot. There were and are still things in it that were revolutionary. Back to the Future Part III is more or less regarded as better than two all around, but that’s where I differ. My opinion, however, is pretty much founded on my personal preferences when it comes to film. 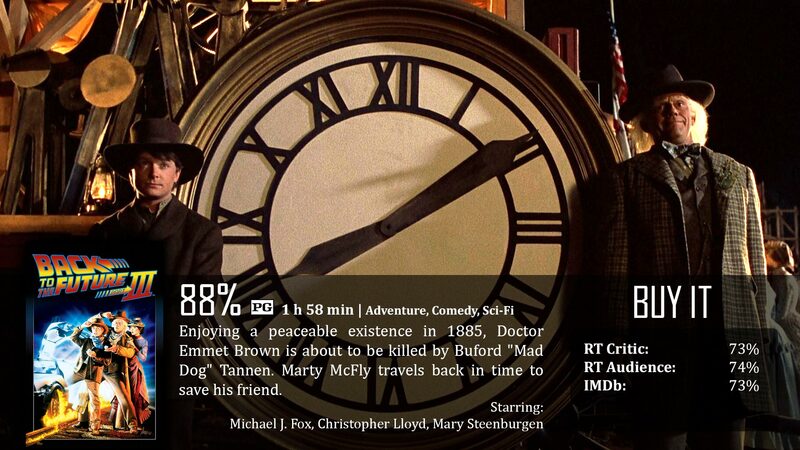 As we learned in the last film, Marty was abandoned in 1955 while Doc Brown was accidentally zapped into the year 1885. Actually, the last film surprisingly had a “to be concluded” text overlay in the end credits, which was curious for a 1989 flick…anyways. Doc wanted Marty to stay away and just live out his life in in 1985 where he belongs, but when Marty finds out Doc was about to get killed by Biff’s old relative in the old west, Marty has an obligation to get Doc out of there before it’s too late. Well, wouldn’t you know it, something always has to go screwy with the time machine, and it runs out of gas. Back in 1885, there were no gas stations, so what they had to do is come up with an alternative way to get the time machine to 88 mph. Their solution? Push it with a train. However, when old Buford Tannen comes a knockin’ looking for blood, either Marty or Doc may not make it out alive…what will happen in this final film? The first thing that I want to mention this time is that the plot was very solid. Last time, it was a bit all over the place, and respectfully, they got a handle on how it should be as far as pacing and direction. Where it falters for me is story. I know I’m probably in the minority here, because my opinion doesn’t really even relate to the franchise…I just don’t like Westerns. I don’t normally like old movies, westerns, country music…all that. Sure, there is a hit here and there that I’ll bop to, but it’s just generally not my kind of thing. That being said, they definitely paid a lot of homage to the old west. We had our bully of the city that kills anyone that crosses him, horses, cowboys, indians, lots of Clint Eastwood talk, and of course small details like cloudy water and less watered down alcohol. Honestly, they did a good job here, which is all you can really ask. I still love the characters. No matter which setting they are in, Doc and Marty are among the most memorable characters in film history. They always will be. Sure…I wasn’t so much of a fan of the setting here, but so what? They still did a great job doing the right thing and making us laugh in the process. That’s another thing, the messages set forth in this film were a lot louder than the previous installments. Both Marty and Doc had to learn two separate lessons. Doc had to learn that you can’t let a broken heart control your life, and Marty had to learn to walk away from confrontations challenging his intellect. It was another way of teaching us how to deal with a situation with a bully. Not only to walk away, but to perceive them as being the pathetic person instead of you. That’s pretty powerful all on its own. All in all, it was pretty clear that Back to the Future Part III had a very solid story with an easy-to-understand plot that wraps the series up pretty nicely. Great review! I am definitely of the opinion that the third is the best of the three. The characters are at their most interesting (and most important) here. I guess the movie isn’t bad, but by then I think they had “streched” the idea a bit too far by then. Good review! Definitely. Great to see the characters as always, but enough is enough, haha. and thanks! I appreciate it.